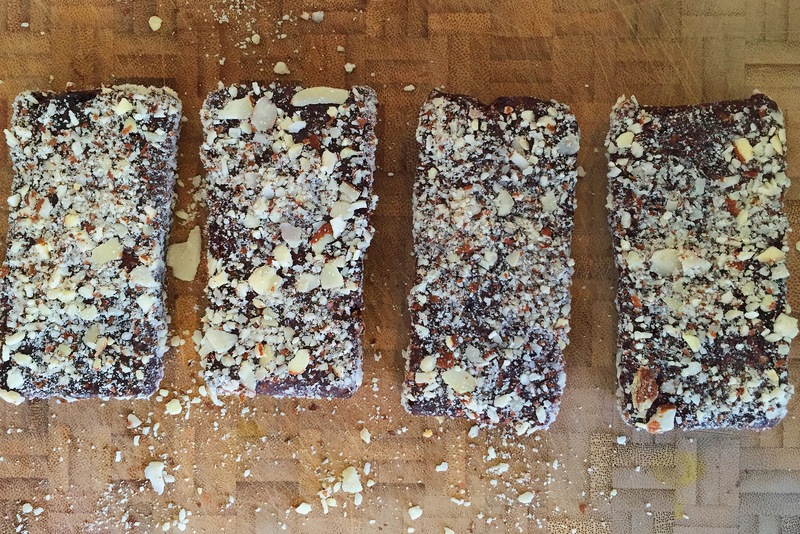 Cherry Chocolate Almond Bars – A Healthy Pinch. Dates are processed with almonds and cashews which make up the base of the bars, giving them a super chewy texture. The recipe calls for cacao powder, however, unsweetened cocoa powder can certainly be used in its place. 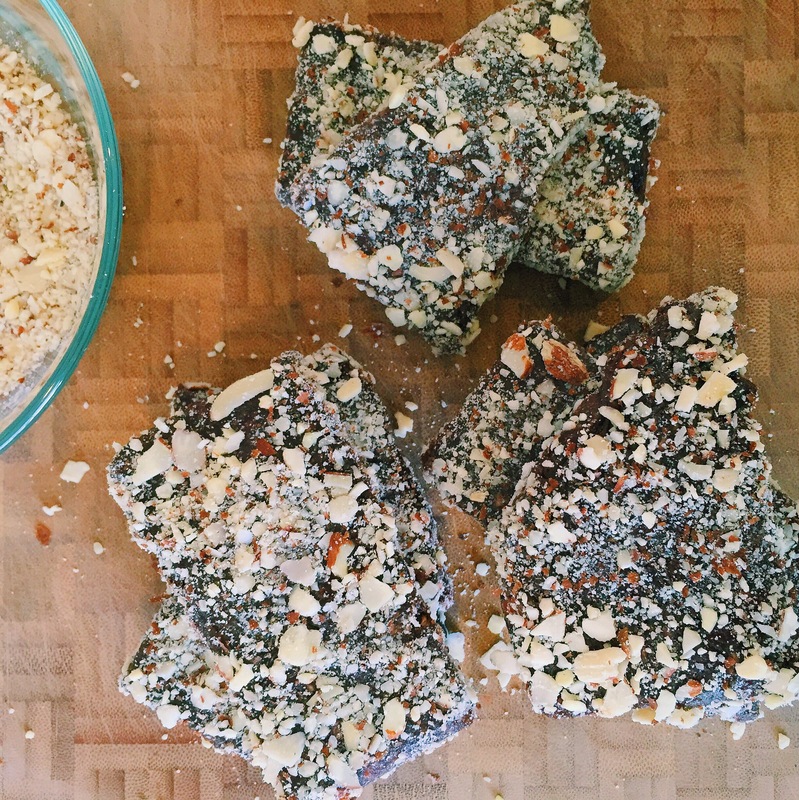 We’ve also added in dried mulberries, maca powder, chia and hemp seeds as well as dried cherries to make these a superfood powerhouse of nutrition (and somehow I had every single ingredient in my pantry…even the dried mulberries)! Roll them in crushed sliced almonds and you’ve got yourself a homemade Larabar that miiight even be better than the original! Now, I didn’t come up with the recipe myself, but adapted it from Food52 because I signed up to test this recipe and give feedback. So glad I did! The only thing I changed was omitting desiccated coconut because quite honestly I cannot stand neither the flavor nor the texture of coconut. Almonds are perfect in its place. Keep these in the freezer for best results- they get cold but not frozen and are a perfect warm-weather snack. In a food processor, pulse the dates, cashews and almonds together to roughly chop them. Add in cacao powder, hemp seeds, mulberries, maca powder (if using), chia seeds (if using), and vanilla and process everything together until a mass starts to form. Withe the motor running, add in water 1 tablespoon at a time, until the dough starts to come together. It should stick together easily so that the bars are not too crumbly, however if it seems too wet or sticky, add in more chia or hemp seeds. The the dough is nice and sticky, add in the sliced almonds and dried cherries and pulse a few times until both are incorporated and bars have a nice, crunchy texture. Place a large double layer of plastic wrap on a flat surface. I found it easiest to layer the plastic wrap on a baking sheet. Roll the dough out on the plastic and gather into a solid mass in the center. Use the sides of the plastic to wrap over the dough as tightly as possible, pressing and shaping the mass into a compact 1-inch thick rectangle. Place the entire thing in the freezer for about 30 minutes. When it’s solid, remove the plastic wrap and cut into 8 bars with a sharp knife. In a food processor or spice grinder, process the ¼ cup of sliced almonds until they are coarsely ground. Place in a small bowl or plate for rolling. Roll each bar in crushed almonds. At this point they are ready to eat! However, they do get soft rather quickly, so I would wrap each bar individually, store in the freezer and pull one out when you want one. They should keep for at least a couple weeks.